Stevedoring Services Limited [SSL] said there has been “major uptick in cargo” which is expected to continue, with the company appealing to importers, forwarders and truckers to collect goods as soon as possible following arrival. “The space on the docks is limited and SSL has to ensure it has the capacity to discharge containers cars, boats and oversized loose on the limited dock space,” the company said. “The hardworking Stevedoring crew have been unloading the weekly cargo ships as swiftly and efficiently as always, moving an average of 36 containers per hour. There is some congestion on the docks due to a backlog of cargo which has not been picked up upon arrival. 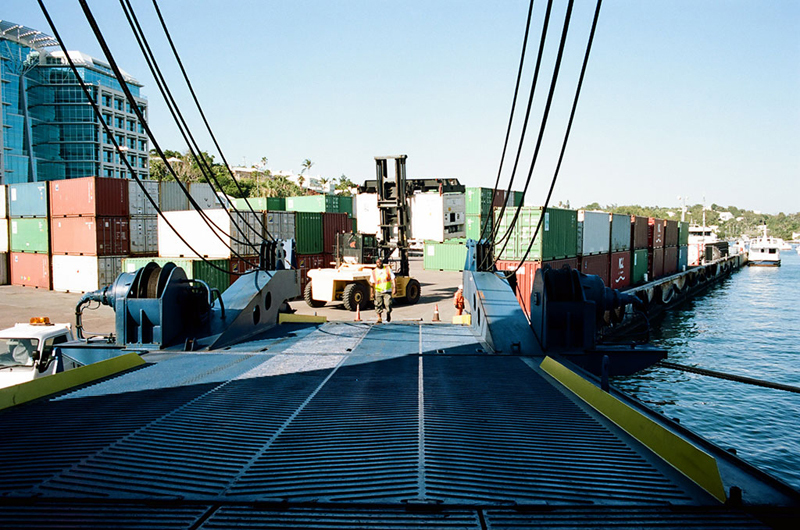 “With multi-tonne cranes and containers, men on the ground and occasional hazardous materials in motion, the safety of those on the dock has to be a priority. “Congestion on the docks can be dangerous and causes delays for the scores of truckers who take the cleared and unloaded cargo to their destinations in grocery stores, institutions, restaurants and homes around the island. Warren Jones, Chief Executive Officer of Polaris Holding Company, parent company of SSL said, “We are pleased with our team’s consistent ability to discharge cargo from the weekly cargo vessels safely and efficiently for our customers. “There has been no delay on that front. However, due to the increased volume of cargo, we are at the limit of what can safely be held on the six acres of the Hamilton docks. Mr Jones continued, “Cargo is not being picked up in a timely manner, which creates a backlog of trucks over the course of the day as our machine operators have to navigate the aisles of stacked containers to extract the one which has been requested. “Also exacerbating the situation is the high volume of breakbulk, cars, and boats, which in the limited space makes a dangerous working environment that much more hazardous. SSL is unable to launch boats on days upon which cargo vessels are being worked, therefore please make early arrangements for the launching of boats on non-ship days. The Bermuda Marine and Ports’ weekly shipping schedules can be viewed on our Polaris Holding Company Facebook page. Please be patient when visiting the dock, understanding that we are attempting to work safely in extremely congested conditions. The docks are congested and the local warehouses are full and as usual everyone blames everyone. Sir George Somers should have had a dam GPS.